Fast, Cheap, Unrivalled Waterproofing Servicing the Brisbane, Sunshine Coast, Gold Coast, Northern New South Wales and Sydney. This advanced waterproofing method involves melting bitumen polyester materials using a blowtorch. The melted substance acts as the protective coating, and once cool, is 100% waterproof. Due to its speed and effectiveness, the area can be tiled or used the very next day! A one trip installation and in most cases can be used the same day. 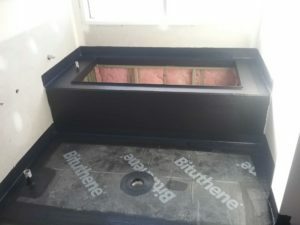 This innovative technique allows you to re-seal areas that have been waterproofed at some stage previously. It is most commonly used as a simple precautionary measure in areas you’re unsure of, or to repair minor leaks. We can simply brush the waterproofing sealant over your tiles, concrete or other materials and the area will be completely protected. 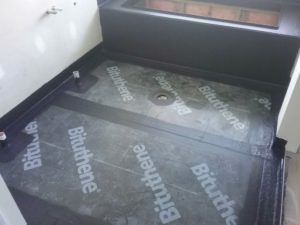 Our waterproofing methods are proven to be faster, stronger and cheaper than other techniques, due to our innovative application equipment. Dryman saves you money both now and in the long term – lower waterproofing prices, longer-lasting results! Eliminate the risk of water leakage damage in your property – invest in the fastest, most affordable waterproofing services around. Call (07) 3807 9013 today to book an appointment. We waterproof all wet areas, shower hobs and trays of all sizes, and full shower walls if required. All perimeters and full floors are sealed and isolated at the door, and we use either a streamline aluminium or mill finish sheet door angles, in different sizes to suit the finish of your tiling and deliver fully waterproofed results. All showers are completed and tested on the day giving you reassurance of no leaks. We torch on balconies with bitumen membrane, this protective pre-seal coating is comprised of 100% waterproof bitumen membrane. Due to its speed and effectiveness, any sealed areas are ready to be tiled or used the very next day! And tested on the day so peace of mind to owner or builder. We can also use liquid sealing and brush on, this method is used if specifically requested. This process is effective and uses multiple layers to ensure a waterproof seal. It can also be used in conjunction with the torch on. We use high quality waterproofing membrane over the surfaces to prevent water leaking from the box. We protect your surfaces with corflute protection board. This seal can also be achieved using the torch-on system. A 3 mm membrane is adhered to substrate (roof), overlapped and keyed off to achieve a fully waterproofed finish. A UV protector is then applied on top of the finished product in order to protect initial membrane from sun exposure. Preparation is key here to ensure access to the wall. We coat the surfaces with …. Membrane usually rolled on to surface. We protect the membrane with corflute protection board. 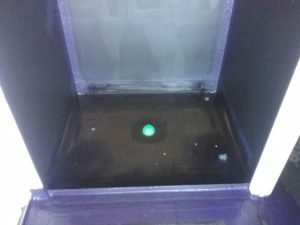 Our techniques uses high quality materials and experienced staff to achieve successfully in preventing moisture penetration. Dryman can also offer a negative seal to areas such as retaining walls. This allows the walls to be sealed internally to stop hydrostatic pressure forcing to internal quarters. This system is made up of a 2 part mixed membrane and applied to substrate i.e. block walls. This allows builders to be confident of no internal water ingress.